It is summertime. The grass is green, flowers in full tilt and the air is full of sounds reminiscent of childhood; children at play, lawn mowers, dogs barking and the wind gently rustling the leaves as they dance in the summer breeze. Veterinary businesses also have seasons. It is not unusual for December, January and February to be slower seasons in practices, especially those affected by winter weather. Years ago, Hill’s Pet Nutrition developed and patented Hill’s TD, a dental diet for dogs and cats. Part of their marketing campaign was February is Pet Dental Awareness Month. Many practices across the country offered, and some still do offer, their clients a 10% discount of dental services if they are scheduled during the month of February. This worked well for practices, keeping their staff hopping during historically slow months. Unfortunately, in many practices this was so effective, that clients withheld treatment for broken teeth and severe periodontal disease, so that they can benefit from the February discount. This was not a win for the pet. Years ago, I asked myself the question, “What makes the people that provide regular dental care so diligent?” I realized, at least in my practice, they were the clients that somehow, by the luck of the draw, won the lottery of time with a staff member that had time to educate them. 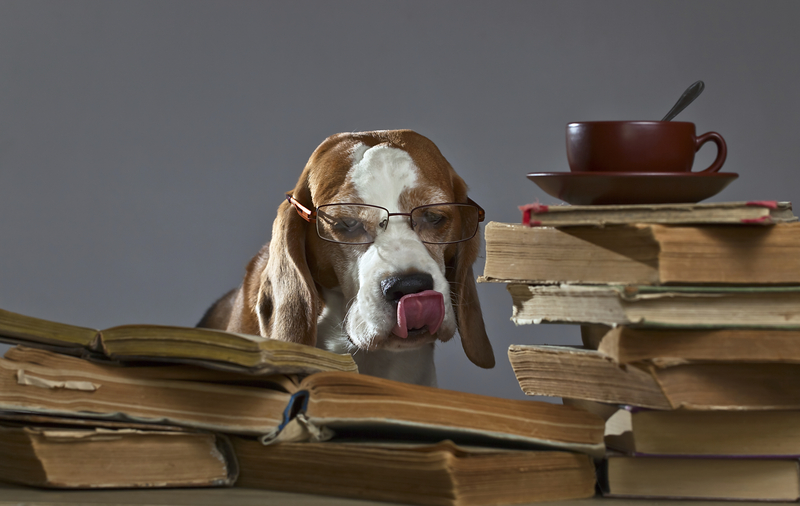 Time is a dear commodity in a busy veterinary practice and unfortunately, educational efforts take a lower priority than a client that has been waiting in an exam room longer than desired. That awareness has driven my efforts in practice for nearly a decade. I decided that if we, veterinary practices, are going to charge the expensive fees that are necessitated by long dental cases, we had better find a way to teach these pet parents what they need to know to minimize dental disease and to minimize their dental bills. Now, I have said this before, but I have an employer that is willing to invest in many of my hair brained schemes. So, I asked if I could host a dental education seminar for our clients. He agreed and I set about creating this experience. We put invitations in the exam rooms and flyers on the practice walls. I stayed after work once a month from 7-8:30 pm willing to share this information…but, attendance was averaging around 2-8 people….hardly worth the effort and expense. Then I tried offering a 10% REWARD coupon to each family attending. This was a one-time, per family education REWARD. My numbers soared. I continued this practice for 7 years, once a month. We eventually had to rent conference room space. I was able with that one-time only offer to educate an average of 12-28 people, one month having as many as 42 people. I have provided this seminar nearly 100 times and each time the clients genuinely appreciate it. And, let’s be honest, they are not attending because they want the information. They come because they want the discount. But, I had a captive audience and my job was to educate and entertain. If it wasn’t fun and if I weren’t approachable, the experience would be lost on them. 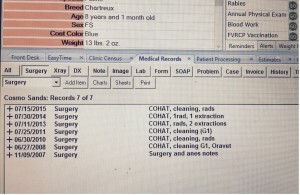 This is what the medical record of an educated client’s pet looks like. This seminar typically is 90 minutes. They would keep me at the venue for an additional hour. They did not share silly pet stories…they asked great questions. They ate up this special time with a spoon. When else would they have unfettered time with a professional from their veterinary practice to ask any questions they like? It has been a joy to be involved in this initiative. Most importantly, though, I began to notice something. The behavior of the clients changed. Education changed their behavior. It was not at all uncommon for clients that attended the seminar to begin to provide annual dental cleanings and assessments. There were key things that they care about; they hate the notion of anesthesia but they love reducing the risk with shorter anesthetic experiences. They love their pets but they didn’t know that their pets suffer in silence. I then thought, I wonder how many clients would like to avail themselves of the discount, but don’t because of their kid’s homework or baseball games, piano lessons or work schedules. How many are housebound? That led me to create the experience online. In the first month, the dental series drove 32 dentistries directly to the table. How do I know? Because they way I set up the program, once the pet parent watches the videos, there is a short quiz. Once they answer all of the questions correctly (further driving home key points), the .pdf file for the reward coupon opens for them to download and print at home. By the end of the month, I had 32 redeemed coupons on my desk. As I say when I consult with practices across the country; it doesn’t matter how talented we are at healing. If we can’t get the patient to the table, we can’t provide the healing we were called to do. And let me bold! Most of the people that read this blog are technicians and veterinarians. Often we don’t have “buying power” at our practices. But, we each have a responsibility to take great resources to management when we come across them. Share this with your practice’s management team.